During my last trip to Taiwan I had a really busy time. The days were filled with meetings and workshops and most of the evenings business dinners. The friday night of my stay in Taipei was the first. I had a phone conference at midnight my time and two more between 7am and 9am the next morning. After the two morning meetings I had such a headache that I decided to stay in bed for a while. Around 2pm I decided to get lunch at ding tai fung, the famous Taiwanese dumbling restaurant chain. For a short time my headache was better but came back anyway and I decided to walking around a bit more. It was around 4pm and I started walking from Taipei 101 towards the Da An area, a busy shopping district with many local shops. Although it was getting dark and I couldn’t use the camera anymore, I walked a bit further and turned back to the hotel through some of the smaller lanes along Zhong Xiao road. I saw a couple of hairdressing shops and I was tempted to get my hair cut inclusive a head massage for my headache. I still hesitated remembering my last Taiwan haircut adventure after which I looked like a freak. So, I bravely walked by heading back towards the hotel. 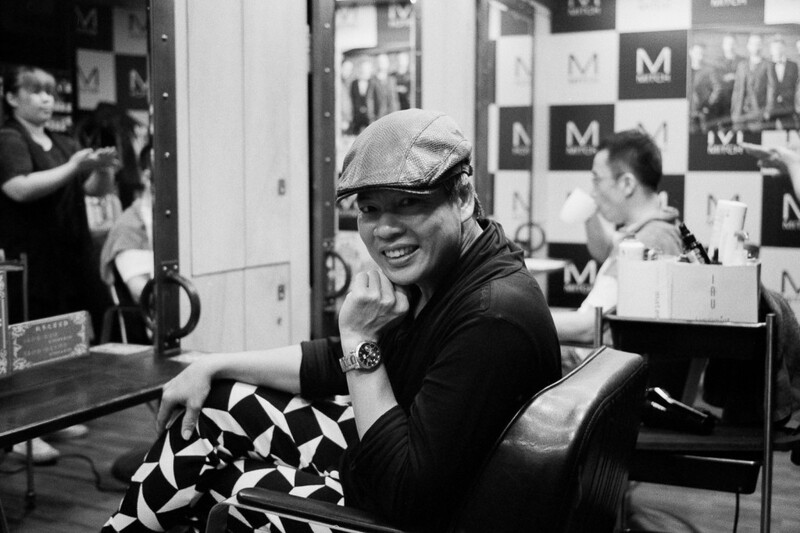 When I came by De Men’s hair salon, I saw a friendly smile. I stopped, I walked on and I went back inside for a haircut. Inside I met the boss Wynne and asked him if I could take a photo. He happily agreed even though his English as well as my Chinese were quite limited. After sitting down I got a cup of oolong tea and a hair wash, followed by a truly virtuous haircut by Rex who also massaged my head for quite a while. Before leaving Wynne got his lomo camera out and one of the staff took a picture of us. Two weeks later I sent the photos by email to Wynne but haven’t heard anything back yet. When I get back to Taipei, I’m going back to the DMH salon and bring Wynne a print of the photo. Of course I’ll get a haircut too. I went back to the hotel with a nice haircut. My headache was gone as well and I was ready to join my co-worker for dinner. great story Ijon ! how can i see your refreshed haircut ? Hey Victor, unfortunately it’s already 6 weeks ago and my hair is back to its original messy state. however, I realize it’s always good to have a camera even on business trip.